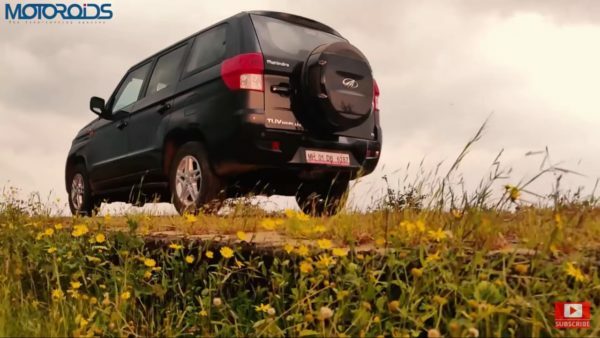 The TUV 300 Plus is essentially a long-wheelbase variant of the TUV 300 from Mahindra. That said, it is more than a long wheelbase variant and offers refreshing looks and a new engine. The car has some design elements from the Italian design house Pininfarina, making it a rather good-looking vehicle and quite proportionate. 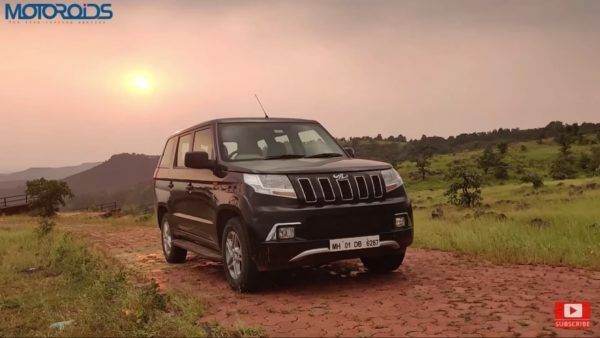 Mahindra claims it to be a nine-seater with a foldable bench on both sides of the rear compartment. We tested it out and here is our review of the vehicle. As stated above, the TUV 300 Plus looks very nice and proportionate. Up front, the car gets massive road presence with its large looking headlights and neat grille. The side of the car carries a boxy shape and looks sort of like an extended TUV 300. It gets 16-inch alloy wheels wrapped in 215 section rubber. The rear gets a spare hanging on the rear door which gets a wheel cover and new design tail lights. There also is a footstep to make entry to the rear compartment a bit easier. There are foot boards on both the sides as well to make the entry in the 184 mm high vehicle a bit simpler. Overall the TUV 300 Plus is a nice looker and would appeal to the audience it targets. Climbing in the interior of this vehicle, the first thing you would appreciate is the nice Faux leather which gets a nice quilted pattern. They get this treatment only at the top end P8 variant. 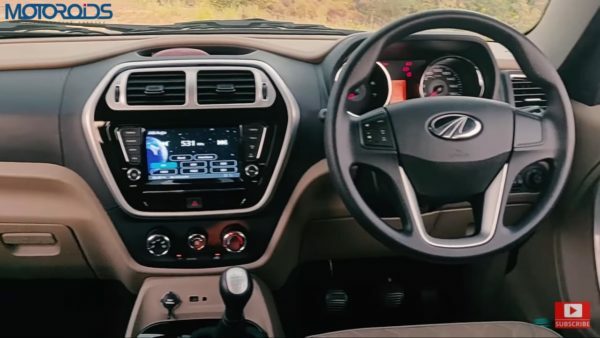 The P8 variant also gets a touchscreen infotainment system which is also seen in other Mahindra cars as well. The front two seats are very comfortable and both of them get lumbar support, the driver seat height can be adjusted as well. There is a small MID in the instrument console which displays information like distance to empty, gear selected and much more, The rear seat is quite spacious but the rear compartment is a bit of an odd commodity. The space is quite limited, the opposite benches do not offer enough room for your legs. However, a design like this is what appeals to the target audience. The TUV 300 Plus uses a more powerful engine which has a capacity of 2.2-litres. This mHawk engine makes a decent 120 hp and 280 Nm of torque. Mated with a 6-speed gearbox the engine is a delight to use with that engine. The engine itself is very tractable and feels very lively. The first three gears are very short and make it more efficient to use. The car delivers an efficiency of about 12 kmpl in the city and about 15 kmpl on the open road. A major problem with the gearbox is the fact that the reverse gear and first gear are right next to each other. There is no ring mechanism to engage the reverse gear and can prove to be fatal in certain situations. The suspension is a bit too soft for use and can be a bit upsetting at low speeds. More on the driving experience in the video at the end. Also Read: Mahindra Owned Automobili Pininfarina’s PF0 Hypercar Is More Bonkers Than A Bugatti Chiron! In conclusion, the TUV 300 Plus is a nice rugged car with the capacity to hold much more people than the regular TUV 300. It is a sensible car and makes sense for the price point at it is for sale. It only gets a diesel manual combo which is the top choice for us Indians in this segment. With prices starting at INR 9.5 Lakh to INR 11 Lakh (both prices, ex-showroom). 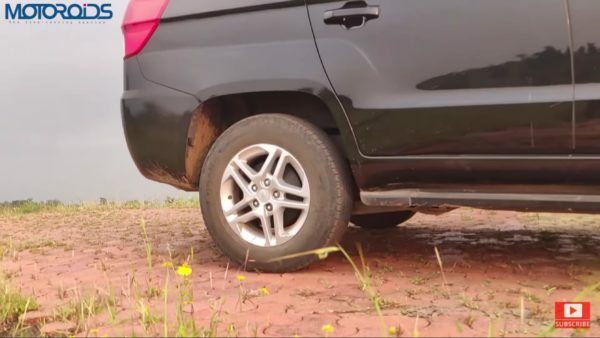 Do watch our video for a much more detailed review of the car.